I don’t know if you watch Little England? We do, painful though it is. Our life in France ( and not that terribly far from some of the action) bears no resemblance to the programme. We didn’t come to have a professional ex-pat lifestyle or socialise totally with other Brits. We have French and British friends and do our best to speak the language and integrate into the community as we would anywhere. It is not always easy, but we feel it is our responsibility. What brought this to mind was the range of nationalities that feature in my French class. Yesterday we had students from Venezuela, Vietnam, Holland, New Zealand, Australia, Uzbekistan and Ireland. Only two from England and me flying the Saltire. Nothing at all like the strange world portrayed on the telly. And I run a global business. 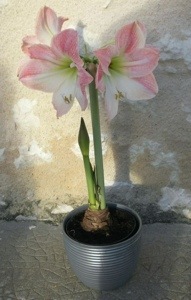 Granted on a small scale, but this week I have sent orders to South Africa, USA, Canada, Germany, Spain, GB and France. I have personal customers both French and British. Probably none of this would make ‘good’ telly. And I don’t want to feature anyway! Lots of to-ing and fro-ing with the website revamp this week. There is always a bot of pressure when choosing new graphics and logo, but we got there in the end. We had to dodge the showers again to get photos of ‘massed’ balls of wool. He who does the photos, prefers natural light. Work continues on the website, but I am hopeful it will go live with a new look next week. The rain has continued for most of the week. Getting progressively worse if anything, and culminating in what could only be described as a deluge yesterday. Good knitting weather though! 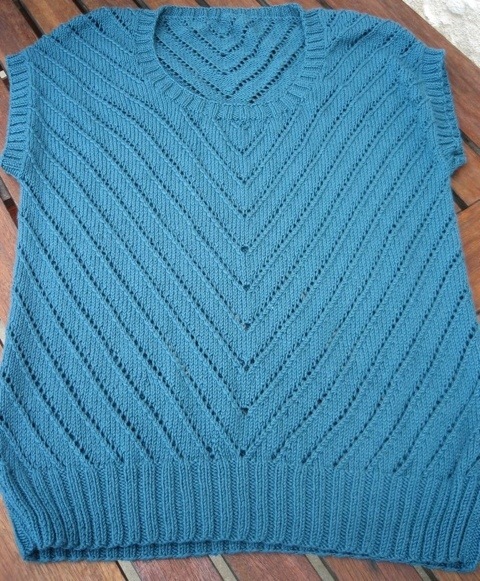 T’s sweater is finished, but has still to be sown up. It has looked quite a strange shape during the process, but I think it will be fine. I have made a few modifications, which might be of interest. I used short row shaping for t he shoulder cast off, which has made for a neater and less bulky shoulder seam. 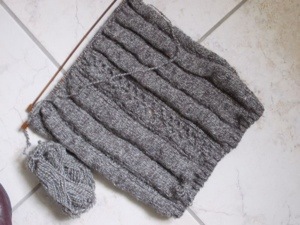 And instead of casting off the sleeve top, I have knitted one row and will sew the sleeve on stitch by stitch. Again this will mean less bulk and will match the finish on the neck. As I write, hail is firing at the window. The week has been like that, more sunshine and showers. Very heavy showers indeed, welcome for the garden, but they have made our fence building very tricky. We have been in and out like yo-yos. 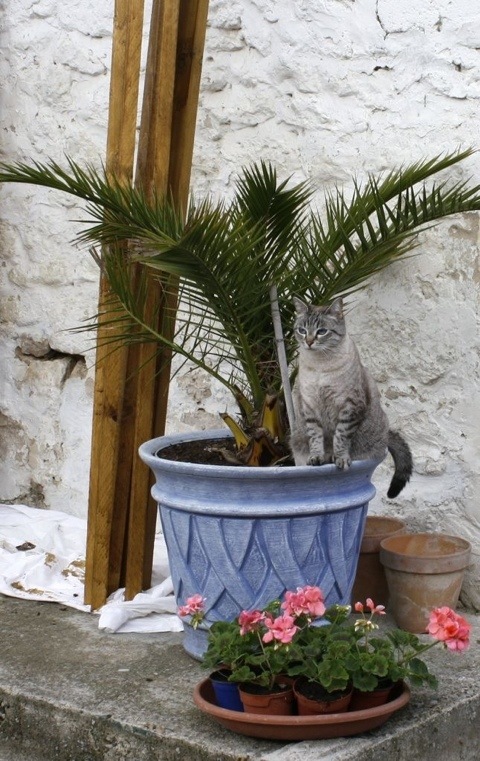 This week’s picture is of Fleur, who has been ‘helping’ with the task. The garden is very green, but it is still pretty chilly and our little lettuces still need protection in a tunnel. The broad beans planted in November are looking great, beans have. Started to form and we have been enjoying the picked out tops as a vegetable and today I am experimenting using them for soup. They are a bit like spinach with a ‘beany’ taste, if that makes sense. We had some friends from Inverness look in on their way home from Spain. We hadn’t seen them since we left and it was lovely to have a catch up, albeit brief. The Alba Yarns website has been exported for a bit of a makeover. Don’t worry, I am still open for business! I am looking forward to seeing the results next week. On the last sleeve of T’s birthday sweater, and may make some progress today if this weather keeps up. The unsettled chilly weather continued this week. Lots of April showers, well needed for the garden. Outside activities have been pretty restricted and the woodburner has been back in action in the evenings. 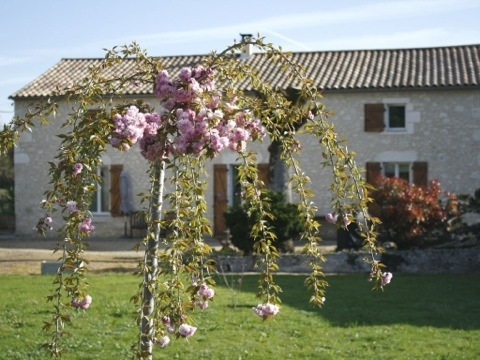 On a positive note, I heard my first cuckoo, the vines have burst into life and the blossom everywhere is magnificent. This week’s photo is of our new weeping cherry – Prunus serrulata kiku shidare zakura. 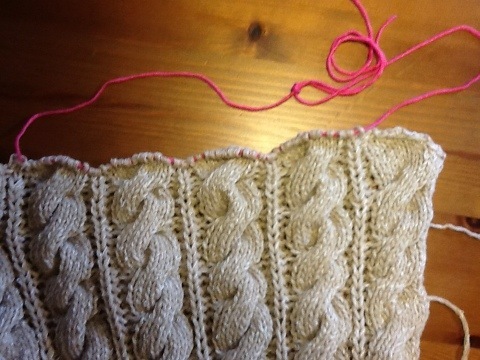 The cable sweater is making good progress and the front is nearly finished. The school easter holidays start this weekend and for me that means two weeks free of French classes. If the weather picks up I hope to be able to help G with painting our shutters which we hope to complete before the high summer. I have been in touch with a number of web designers this week as I want to make some improvements to the website. Watch this space, I will keep you posted with developments. It’s my fault! After gloating about the warm weather last week, we saw a return to near wintry conditions. Of course, nowhere as bad as Britain. I was especially sorry for Aboyne – the hottest place one week and thick with snow the next. This Easter weekend promises to be a little warmer, and might stay dry! Good Friday is not a public holiday in France, only Easter Monday. I have spent a lot of time this week trying to fix a problem with my website. Lots of text just disappeared from the front page. Fortunately it did not affect the shop part of the site. No use trying to shift the blame, I am the only one who works on it. After spending a lot of time looking for the problem and on the software support forums, I gave in and emailed the software manufacturer. I still don’t know what I did, but it is now fixed – hurrah! Today, Easter Monday, I am a petanque widow, which has spurred me on to finish one of my projects. I always put off the sewing up, but at last it is finished. Worked in Sirdar Flirt yarn – which is lovely and much nicer than its name – this will be a useful item for my spring wardrobe. The pattern is 9413.